← “Mathematical Methods” on sale for $62 at Cambridge! Updated some descriptions thanks to commenter VA! When we woke up on Monday morning, the massive crowds of Palm Sunday had to a large extent dispersed, though the city of Seville was still quite lively. 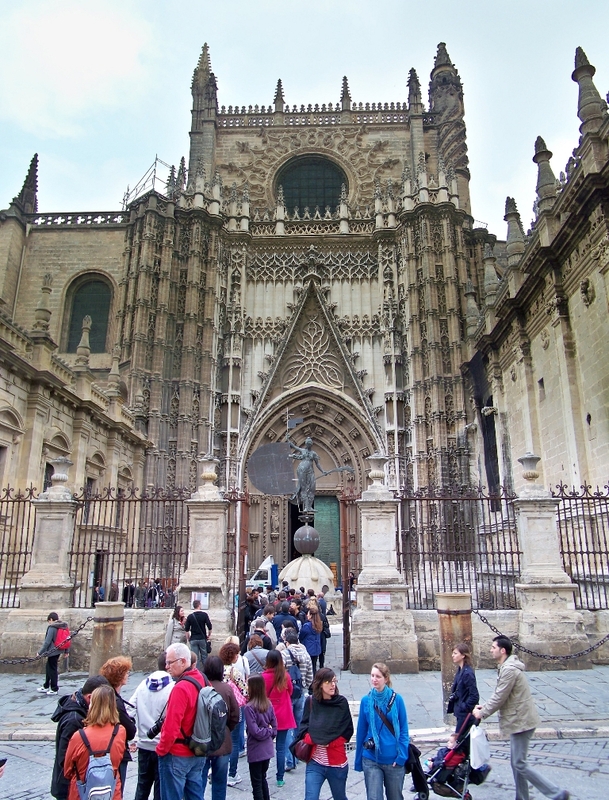 We had a lot to do, so we wasted little time in making our way to the Seville Cathedral to do some sightseeing. There was already a lengthy queue waiting to tour the inside of the massive building. Entrance to the Seville Cathedral. It is hard to do justice to the size of the Seville Cathedral (Catedral de Santa María de la Sede). It is the third-largest church in the world, with some 11,500 square feet of interior space, and the largest Gothic cathedral in the world. Like much of the early architecture in southern Spain (Andalusia), its architectural style is a curious mix of Christian and Muslim tastes. 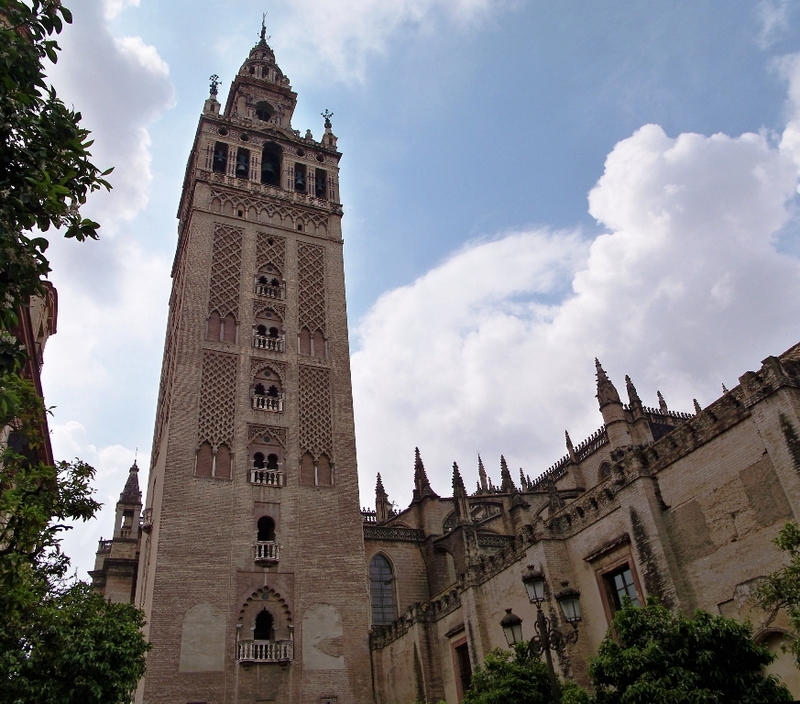 In fact, the Seville Cathedral, whose construction began in 1402, incorporates a number of elements from an earlier mosque built on the site, most notably the Giralda minaret that was converted into a bell tower. The Giralda of the Seville Cathedral. The cathedral construction was completed in 1506, but only five years later the central dome collapsed and needed to be rebuilt. Another collapse occurred in 1888, and reconstruction continued until 1903. One is welcomed into the cathedral with a bronze statue that represents “The Triumph of Faith”. 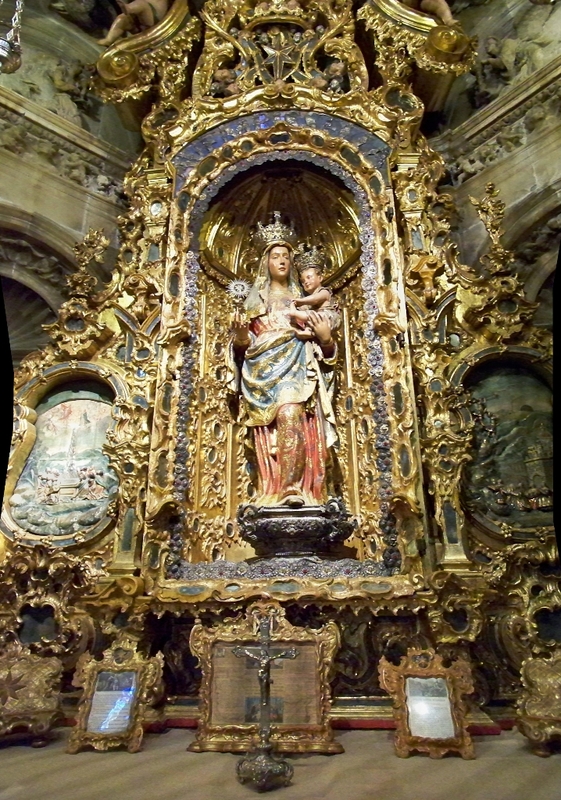 "The Triumph of Faith" at entrance to Seville Cathedral. Once inside, it is difficult not to be somewhat awestruck at the massive size of the cathedral; the ceilings are some 13 stories high. The legend has it that the planners of the cathedral said, “Let a church so beautiful and so great that those who see it built will think we were mad“. 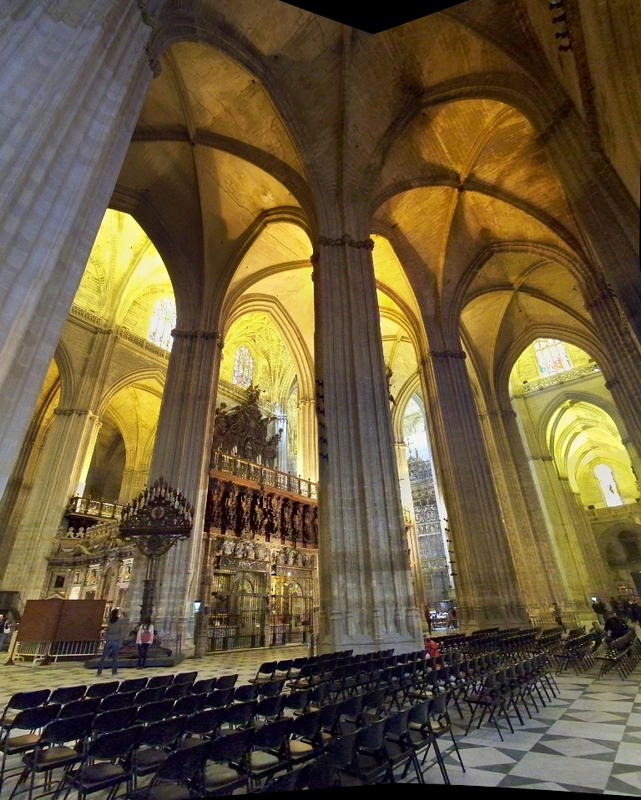 Panorama of the interior of the Seville Cathedral. 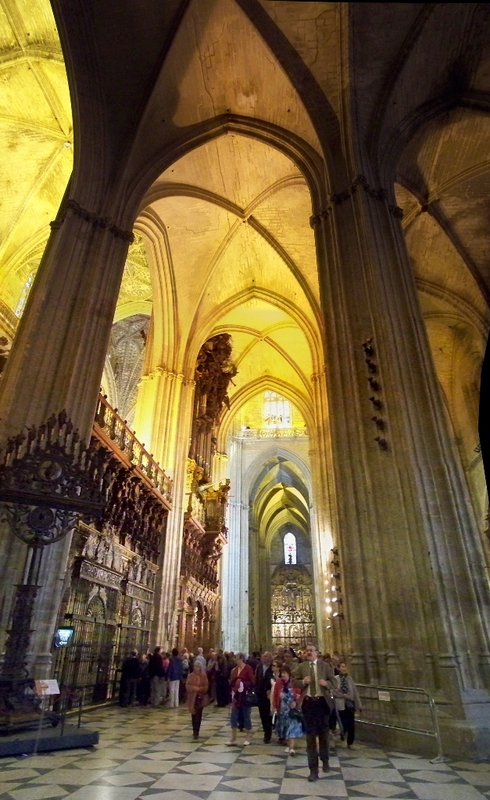 Another view of the interior of the Seville Cathedral. As could be expected from such an opulent and grandiose building, the Seville Cathedral contains many old works of art, some quite ghastly. 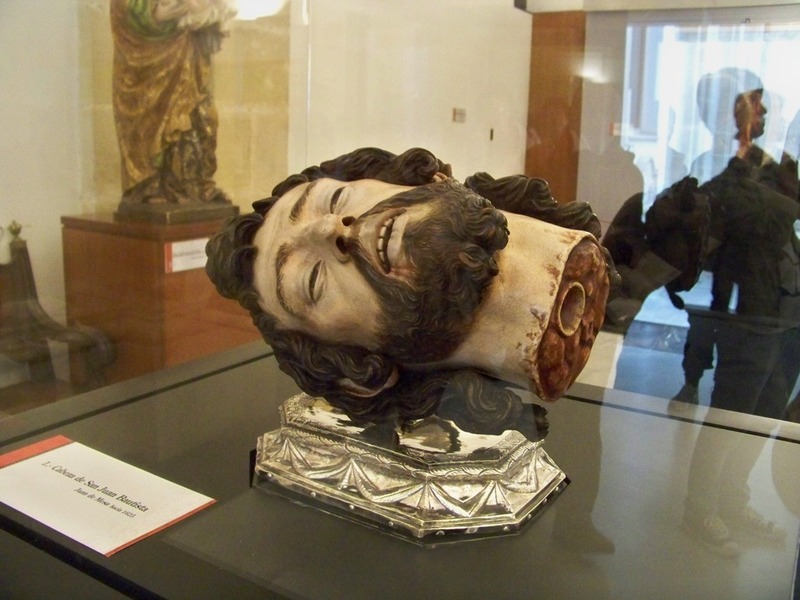 In a small entrance museum one is treated to a lifelike sculpture of the severed head of John the Baptist from 1625 (image behind link, since it is quite gory). Pretty much everything in the cathedral is a piece of artwork, regardless of its role or overall importance. For instance, the entrance to the “retro-choir” (space behind the high altar) is very old and quite compelling. Entrance to the retro-choir (retroquire). We had purchased audioguides to learn more about the cathedral’s history and the roles of the various chambers within, but I was so overwhelmed by everything that I hardly took note of the tour — I suppose this is what the architects would have hoped for! 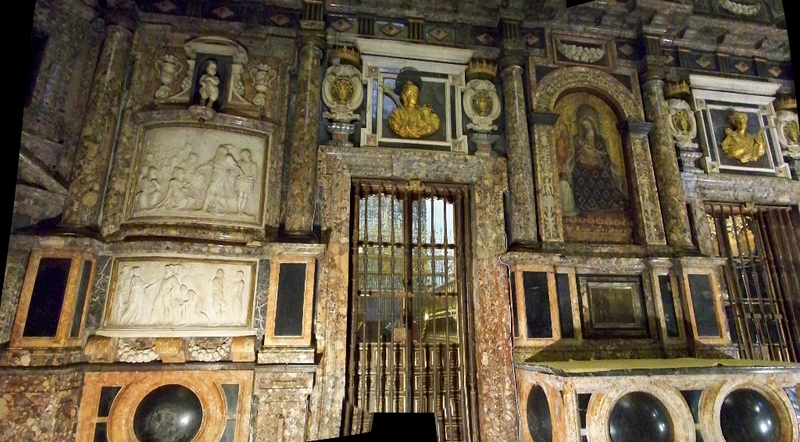 Chapel of the Virgin Mary, in the Seville Cathedral. 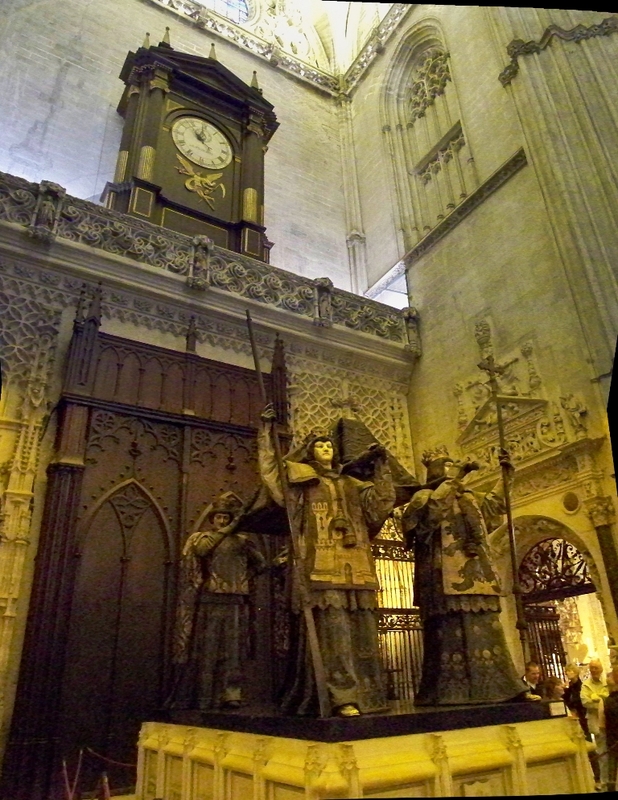 There are also multiple altars within the Seville Cathedral; it appeared that the altar of the main chapel was under renovation, so much attention was being paid to the still magnificent “Altare dell’Argento” (Silver Altar). 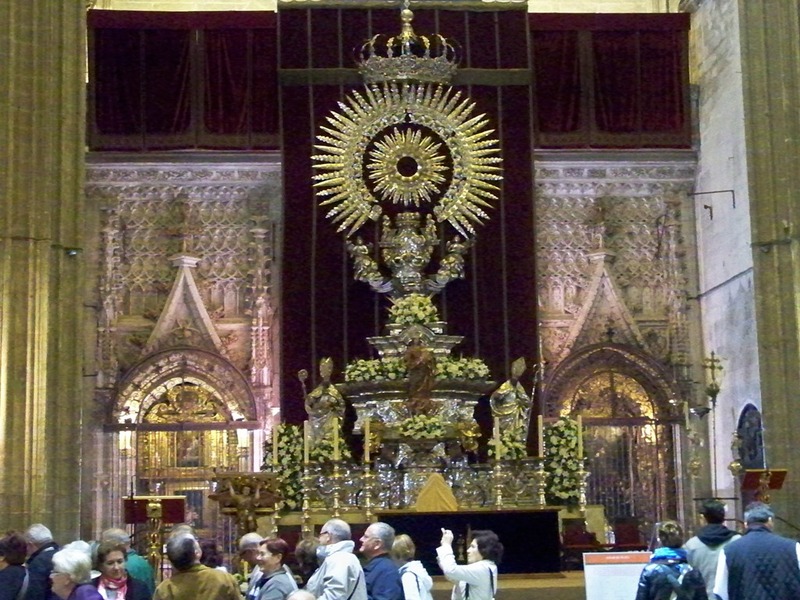 The Altare dell' Argento, in the Seville Cathedral. Many of the church’s sights appear far above ground level; the stained glass window in the following picture was very near the ceiling, probably 10 floors high. 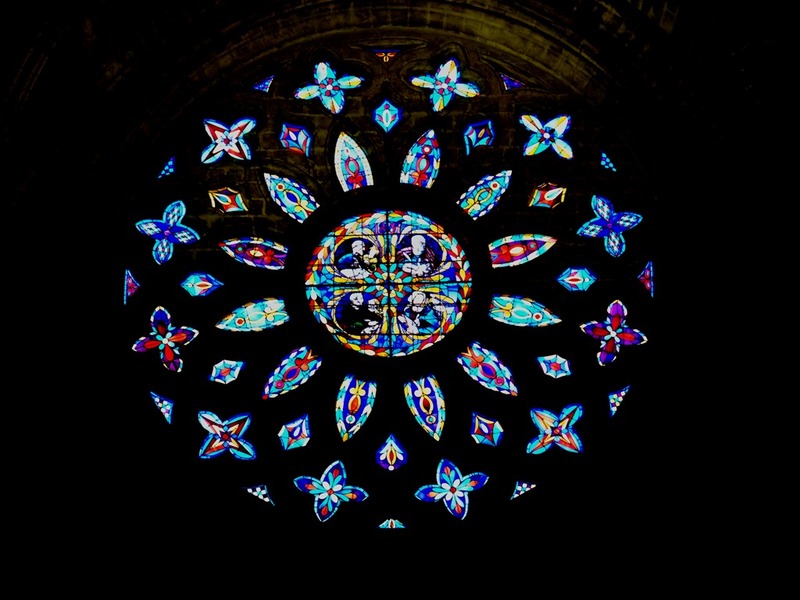 Stained glass rose in the Seville Cathedral. Everything is huge in the cathedral, and designed to impress; check out, for instance, the massive facade of the cathedral organ. Organ of the Seville Cathedral. Even in all this splendor, perhaps the most interesting part of the cathedral is a non-religious one: the burial place of Christopher Columbus! 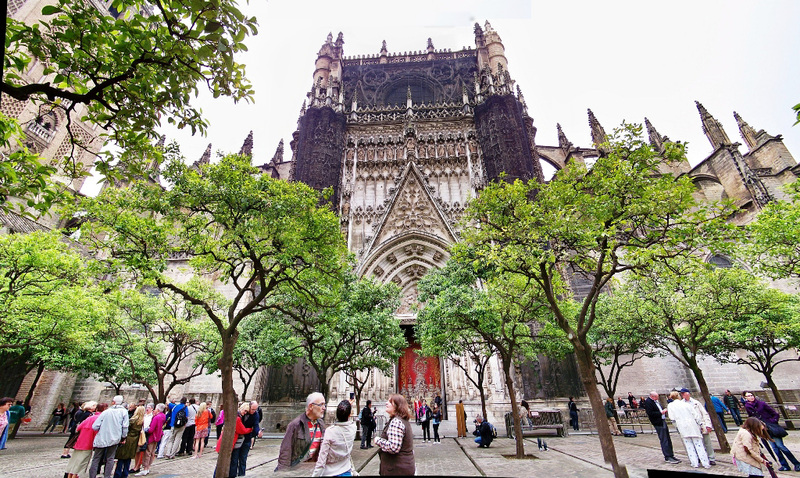 The sculpture of the tomb matches well with the cathedral; at first glance, one doesn’t realize that the remains were brought to Seville only in 1898, and brought with them some controversy. Columbus died in Valladolid, Spain, in 1506, and his remains were originally interred there. At the request of his son, however, they were transferred in 1542 to the Dominican Republic, and later transferred again to Cuba in 1795. 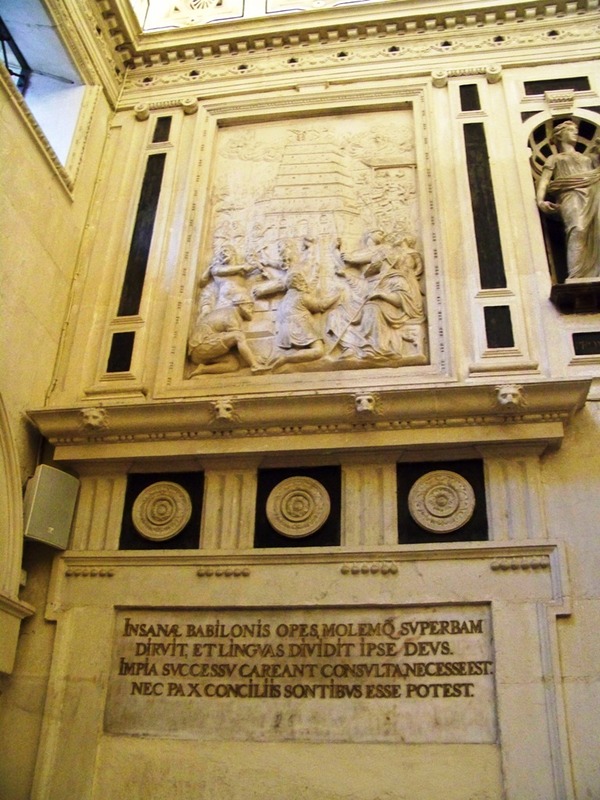 They were finally brought to Seville in 1898, and the tomb was constructed for him. Even with such a large amount of travel it was assumed that the correct body was in fact buried in Seville, but another coffin had been discovered in the Dominican Republic in 1877 with Columbus’ name upon it. In 2003, DNA tests confirmed that the remains in Seville are likely Columbus’, but it is possible that part of his remains are buried in the other location, as well! From Columbus’ tomb, we moved on to the main sacristy of the cathedral, where sacred artifacts are stored. The main sacristy of the Seville Cathedral. From the sacristy, we moved on to the “ante-chapter house”, the antechamber to the cathedral’s chapter house, where meetings would traditionally be held. The walls of the ante-chapter house were lined with images of Biblical scenes; I’ll just post one for folks to try and identify! Biblical scene in the ante-chapter house. The chapter house itself is a magnificent chamber; my panorama can only capture a portion of its elegance. If you aren’t convinced yet of the opulence of the Seville Cathedral, you should know that the next room we visited is called the treasure room! It contains many priceless artifacts, and a number of quite bizarre ones; the next photo I took is of the cathedral’s collections of reliquaries, containing the supposed remains of saints. 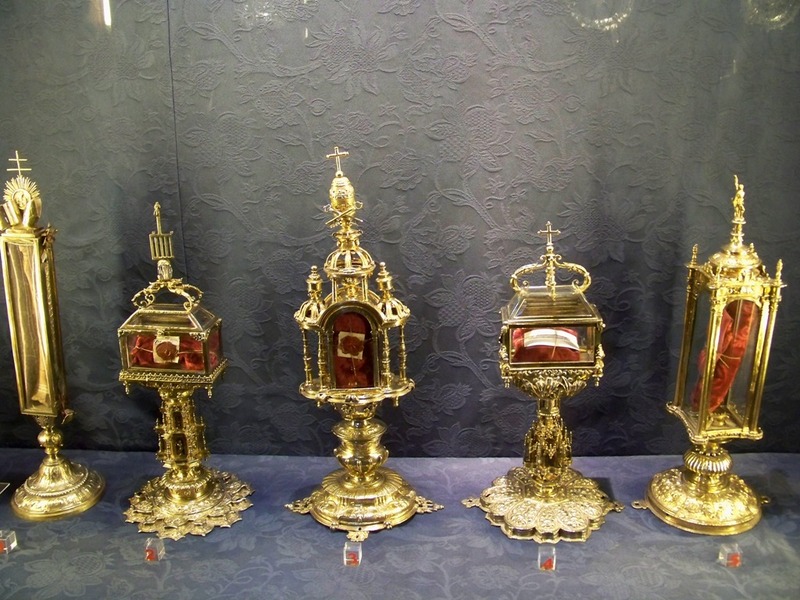 Reliquaries of the Seville Cathedral. Note the bone in the left-most container. Our next stop was the Giralda tower. At 343 feet, it is a magnificent place to see the city from above; as a former minaret, one ascends it by ramp — the imam would ride on horseback to the peak to sound the call for prayer. One would think that a ramp would make the climb easier, but the last 50 feet is still a pretty painful journey! Nevertheless, the view of the city from the top is well worth it, as the next two panoramas hopefully show. 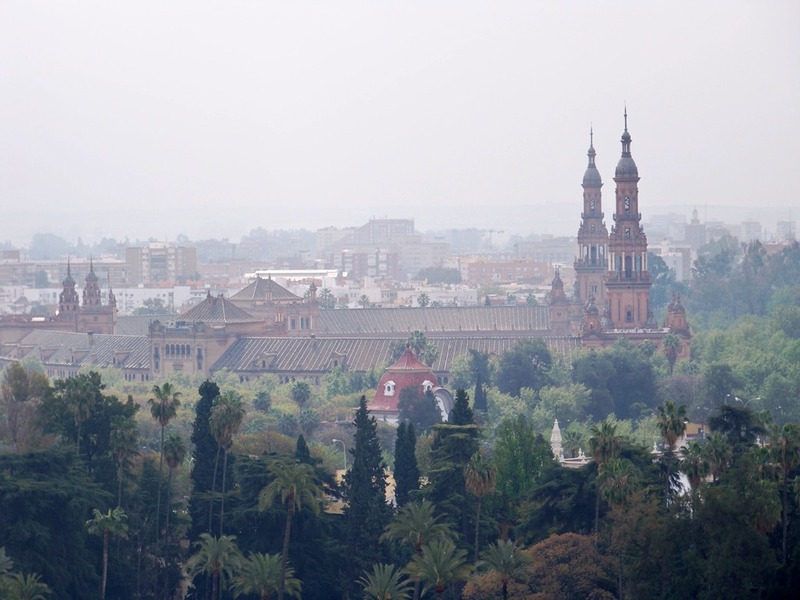 Panorama of Seville, from the Giralda. Southern-facing panorama of Seville, from the Giralda. 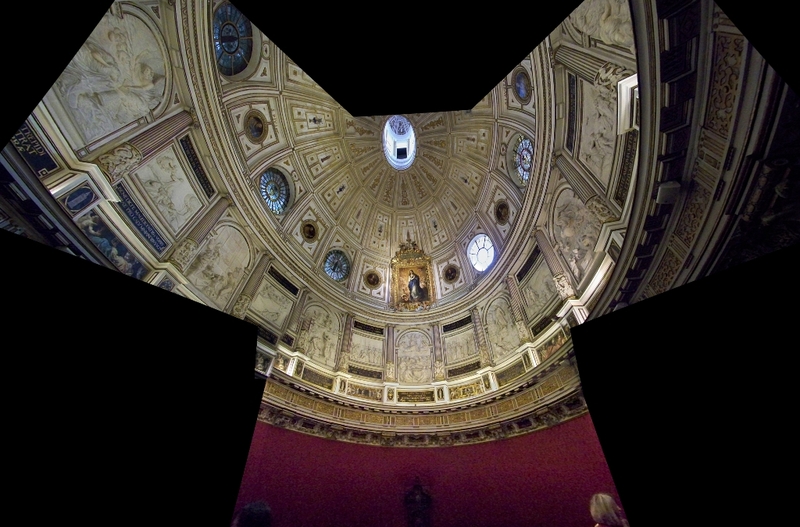 In the second panorama, one can see in the distance a building that at first glance I thought was another cathedral. In fact, I was looking at the Plaza de España, which we would visit later that day (and talk about in the next post). The Plaza de Espana, from the Giralda. At the top of the Giralda, Beth and I ran into the rest of our group (we had lost track of them soon after entering the cathedral). We agreed to meet at the orange tree courtyard when we were finished wandering. The orange tree courtyard of the Seville Cathedral. This courtyard is the other significant structure remaining from the mosque that had previously been on the site. It was a lovely place to relax after an extremely exhausting tour of the cathedral. But our tour of Seville had hardly begun at this point! On that same day we would also visit the Alcazar Palace, the Plaza de España, and take in a flamenco show. But I’ll leave a discussion of those activities for the next post. One thing to add is the lovely scent of orange blossoms all through the city and especially in the courtyard. I wish I could have brought it home. 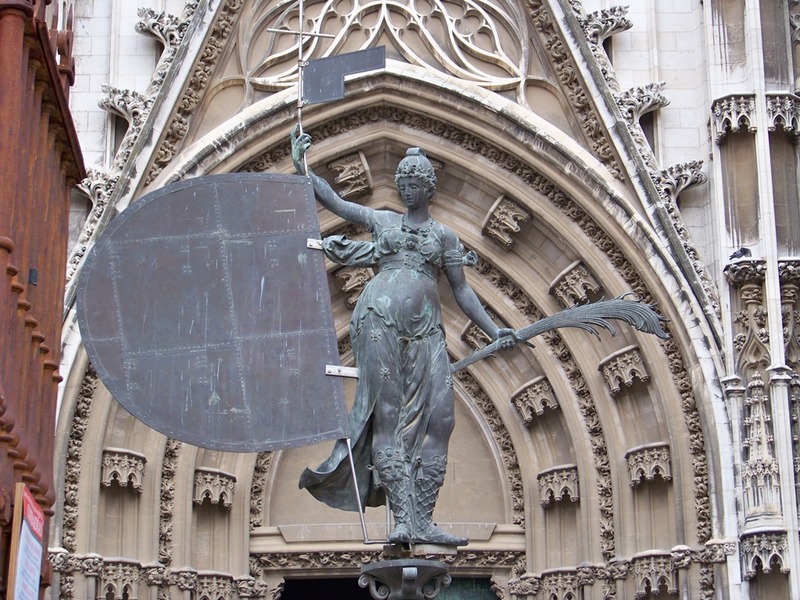 The bronze statue is a depiction of the triumph of Faith. The crowned gal you found in St. Anne’s chapel is Mary, and the chapterhouse relief would probably be the construction of the tower of Babel, it’s a bit hard to tell at my phone’s resolution (the expression of the faces could be relevant – if everyone appears to be having a mighty good time it might be the Temple, but that’s usually not depicted as multi-storied). Thanks for the comment! I revised the dates in post #4: don’t know why I wrote “BCE” instead of “CE”. I’ll revise the other points tomorrow — having just finished the post, I don’t want to work on it again for at least a day! From the pictures it is clear that the cathedral complex is only partly in gothic style.